Review | "A Touch of Sin"
It's always amazing how much information director Jia Zhang-Ke can fit into his expansive mid shots, his subjects dwarfed by towering mountains or sky scrapers as if they are going to be swallowed up by their oversized surroundings - in this case, a China that has become much too big and unwieldy for its own good. The title of A Touch of Sin is a somewhat ironic play off of King Hu's 1971 film, A Touch of Zen, but the world Jia depicts is a long way from Zen. Here we are introduced to four different people living in modern day China, each feeling overwhelmed, abused, or otherwise trapped in a world of corruption and sin, and each in their own way resort to violence to regain their dignity. There's a disgruntled miner, frustrated that money once promised to the workers has gone to the corporate bigwigs through bribes and underhanded deals. 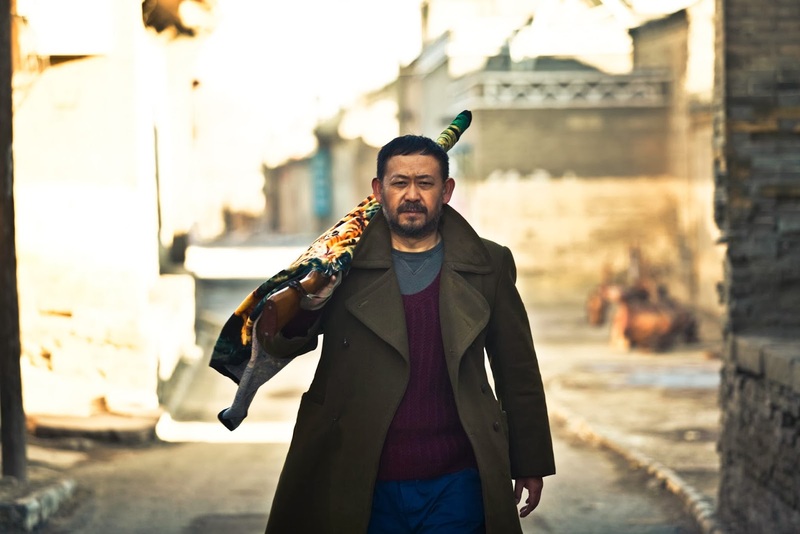 There's a migrant worker drifting by the Yangtze River who finds newfound pleasure in owning a gun. There's an adulterous receptionist who is taken advantage of by an unruly client, and finally a young factory worker who jumps from job to job, never quite able to fit in. Zhao Tao as Xiao Yu in A TOUCH OF SIN, a film by Jia Zhang-Ke. Each one finds themselves caught in their own personal hell, overwhelmed by a China that has grown so exponentially that it has lost its own identity. The Chinese economic boom has increased the wealth gap to the point that it has changed the very landscape of the country, as Jia has so memorably chronicled in films like Still Life and 24 City. Jia is, perhaps, the foremost chronicler of modern Chinese life, which is impressive considering the amount of control the government often exercises over its film makers. Jia's China is one of great economic process, but plagued by cultural rot lurking just beneath the surface. As the rich get richer off of unfair dealings, the rest are being increasingly left behind, victims of unfair circumstances from which they cannot escape, to the point that violence seems the only solution. But Jia isn't just holding a mirror up to his own country, he's holding a mirror up to America as well. There's something startlingly universal about A Touch of Sin that should give us all pause to reflect on why this all seems so familiar. The world of the film doesn't seem so foreign, which is troubling in and of itself. In an America where violence is commonplace and mass shootings are the norm rather than the exception, what does this film say about us? What have we as a society created when violence has become so ingrained in our culture? Jiang Wu as Dahai in A TOUCH OF SIN, a film by Jia Zhang-Ke. The violence in A Touch of Sin isn't pretty or glamorous. It's shocking, brutal, and difficult to watch. Jia uses it sparingly, so when the tension finally snaps it's like a punch in the gut. This is a deeply felt meditation on violence, its nature, its roots, its consequences. While the film's four vignettes don't really connect much beyond their common theme (all four incidents are based on real occurrences), and some are more compelling that others, but they add up to a powerful whole. The first segment could have made an excellent standalone film on its own, but when grouped with the other three tales, it becomes something more - a portrait of a dying culture, lost and floundering in a new and modern world. And when Jia turns the camera on the audience in the film's final moments and asks "do you understand your sin?" we forget we're watching a foreign film about a distant country, suddenly it becomes deeply personal. Jia hits us where it hurts, and it's impossible to look away. A TOUCH OF SIN | Directed by Jia Zhang Ke | Stars Jiang Wu, Zhao Tao, Wang Baogiang, Luo Lanshan | In Mandarin w/English subtitles | Now playing in select cities. Blu-ray Review | "The Hitch-Hiker"
Review | "Escape from Tomorrow"